Yesterday I came across this little snippet on Trove about my grandfather’s younger brother George Michael Kunkel. 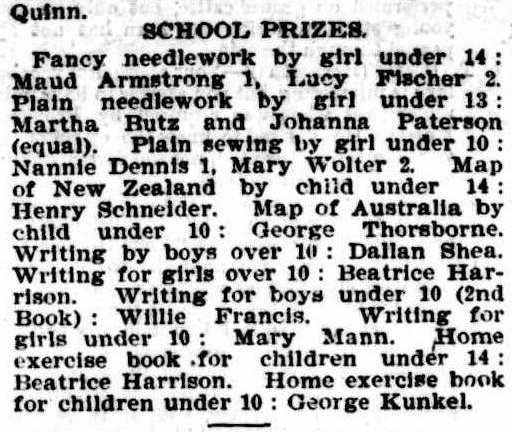 He had won a prize at the Beenleigh Show in September 1895 for “a home exercise book for children under 10”. Now this would be a delightful but comparatively unimportant find in the normal course of research events. However it meant much more to me than that because George would die, aged just 14, less than four years later on 1 May 1899. Can’t you just see him sitting at a table in the railway camp, writing his evening homework in his exercise book by the light of a kerosene lamp. Just imagine his excitement to have won that prize – I wonder whether it involved just a certificate or if there was some practical item or money. It warms my heart to think of his pride in his achievement. I’m so pleased that this young boy experienced success in his short life. Trove Tuesday is an initiative of Amy from Branches, Leaves and Pollen. George Michael Kunkel was born in Toowoomba on 18 October 1884 and conditionally baptised there on 10 December 1884 with witnesses Thomas Iain and Annie Iain. Why his baptism was conditional I don’t know but I suspect he was not a well child and may have had some physical disability. It was certainly nothing to do with his parents’ religious standing as George and Julia were dyed-in-the-wool committed Catholics. The mathematical among us will already have realised that George was already 10 when he won the prize. Again his possible disability may have had something to do with that. Little else is know about George other than that he attended the Logan Village school in the early 1890s. Oral history suggests he was buried at Jimboomba but I have been unable to verify that. Perhaps it’s time I bought his death certificate. This entry was posted in Family History, Trove Tuesday and tagged Annie Iain, Beenleigh, George Michael Kunkel jnr, Jimboomba, Thomas Iain, Trove Tuesday by cassmob. Bookmark the permalink. What a wonderful find Pauleen. There are many who died young like George in my family tree and so I realise the significance in finding something like this to add to the story of their lives which were too short. Thanks Aillin, somehow it seems to make his life less transient. Oh what a beautiful and touching story Pauleen. Thanks for painting the perfect picture of George at work, in his “home exercise book” by the light of a kerosene lamp. I’m guessing his death certificate will give the cause of death. Look forward to hearing more as your gradually unravel the story of this little chappie’s life. Thanks Catherine. I do need to get his certificate so I can clarify why he died and where he’s buried but I’ve been spending like a drunken sailor on books and travel lately so perhaps it might need to be a Xmas present. What a wonderful find, made the more poignant by George’s early death. It is emotional stories like that that make family history such an inspiring hobby. I do like the way you pictured him writing his homework and it was good to get the biolgraphical note at the end. Good luck in finding out more.